Reviewing a service like GooSync isn't easy. On the one hand, it doesn't do as much as other online sync services, such as Zyb and MobiCal, both reviewed recently. On the other hand, it links into the big G. Google. Which totally tips the other factors on their heads. This quasi-religious saga started with me becoming very aware that my PIM data backup was locked into Microsoft Outlook, a commercial application that was tied to one computer by Microsoft's activation procedures. And, of course, many computers wouldn't even come with Outlook these days and I'm blowed if I'm paying £100 or so to buy a copy. And I don't believe in warez or pirated versions. What I wanted was something else, free and open, to sync my PIM data to, preferably accessible from anywhere on the planet. Hence my dalliance with Mobical, linked above. So (and I apologise for straying off topic at little here) I settled on GMail, figuring that all my messages would be able to stay online and searchable, with zero spam. And the chances were good that Google would be around in the long haul, with no chance of my mailbox disappearing because a company had gone bankrupt. (Which is to say that I have nothing whatsoever against UKOnline, Mobical or Zyb, but let's face it, Google is a lot, lot bigger.) And, knowing Google, it was all stay free. 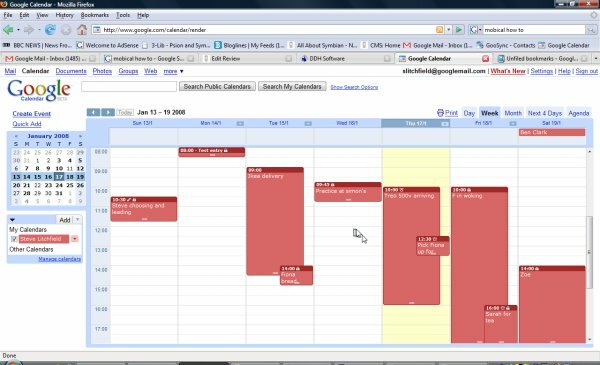 Toffa's GooSync came along at the start of 2007 and promised SyncML synchronisation to Google Calendar, at which point I took note. You'll recall that SyncML is the standard synchronisation markup language used for widely different systems to be able to exchange PIM data. And most software systems now use it, including PC Suite in the Symbian OS world. In my experience, SyncML has been 99% foolproof, and I've had no huge scares syncing multiple devices to multiple local and online systems - which was a big relief. So SyncML works. Syncing my smartphone's Calendar to Google Calendar was a big start. After all, with my email now taken care off by logging into Google, having my Calendar there as well made a lot of sense. But Contacts was the other biggie. 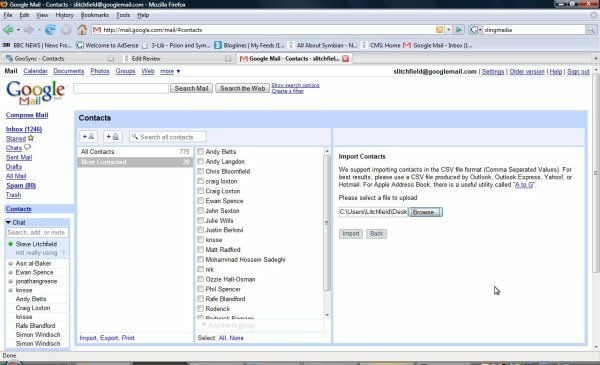 Then, more or less simultaneously, Google's GMail acquired a proper Contacts module and GooSync started promising contact syncing as well - at which point I really woke up and started to take notice. Now for a few caveats. Google (at the moment) have no SyncML technology in place. So if you want to access your Google Contacts or Calendar via a phone then you have to use the Google mobile web site(s). Plus the GMail Java application, but that's something different again. GooSync is able to read and write data into Google Calendar because Google have made a programmer's interface available, so with a SyncML engine at GooSync HQ they're able to sync with my (in this case S60) smartphone and then sync again (transparently) with Google Calendar. The bottom line is that the system's working quite well, reflected in my score above. My Calendar, to which I add 4 or 5 events every day, mainly on my smartphone but occasionally in Google Calendar, is syncing perfectly through GooSync Premium. Each sync takes a few tens of seconds and is initiated from the 'Sync' application on the phone. My Contacts are kept fully in step with the data set on GooSync's servers, and they provide a basic viewing, search and editing interface for online maintenance, if you'd rather paste in stuff there and not type into your smartphone. 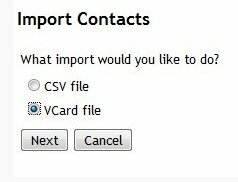 Then, once every few weeks, if enough new contacts have been made or entries altered, I do a manual export/import operation into Google Contacts, which takes about two minutes in all. As mentioned above, there's no support for handling to-do lists or Notes, which is a shame. Most of the blame is probably Google's in that they haven't yet provided import or interface mechanisms for Google Notebook, or indeed a proper to-do Google mini-app. But I'd have thought that Toffa would have added SyncML support for these data types into GooSync, in order to be ready as and when Google extend their applications further. One worry I had was about handling incoming vCard files, i.e. complete sets of new contact data. Given that Google Contacts was effectively a read-only version of my real, synced contacts, I didn't want new contacts to be swallowed up by GMail, to be overwritten at some point in the future by a new import set of contacts. It turns out to be easy enough to solve. GMail presents a vCard attachment as a downloadable file. 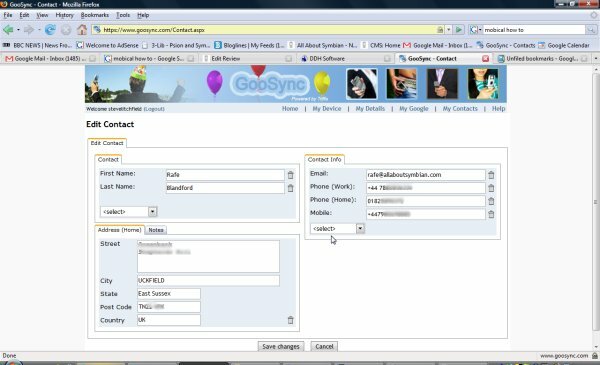 It's then easy to grab it and re-import this into the GooSync Contacts module. Or indeed to open the attachment directly in my (S60) smartphone's Messaging application and 'Save as business card', going directly into my Contacts store. It's been a rocky ride, but reliance on a specific PC and reliance on the commercial (and pricey) Microsoft Outlook are almost over.... thank goodness. I'm arriving in the 21st century, everyone! 1) the above solution (GooSync) is still reliant on Toffa not going bust, of course, but even in that eventuality, at least my data's in Google's repositories and one would hope for another rival system to take up the SyncML gauntlet.